Have you heard about Interracial Fish? Is this the reason why you’re here in this Interracial Fish review? If so, then you come to the right place because I’ll be discussing everything about Interracial Fish that there is to talk about. Interracial dating has been becoming more popular because racism is finally being addressed by many. This is also the reason why people are no longer afraid to show off who they are dating because the majority is becoming acceptable. Of course, there are still who are against it, but you shouldn’t get affected by them. If you know for yourself that you’re not doing anything, then there’s nothing to be ashamed of. So let’s start with the Interracial Fish review by reading the information provided for you below. Interracial Fish is known as a dating site for people who are interested in an interracial relationship. This online dating website believes that meeting dates are no longer limited through family, friends, and relatives. The reason behind this is because online dating is here to cater to your needs no matter how busy your life is. 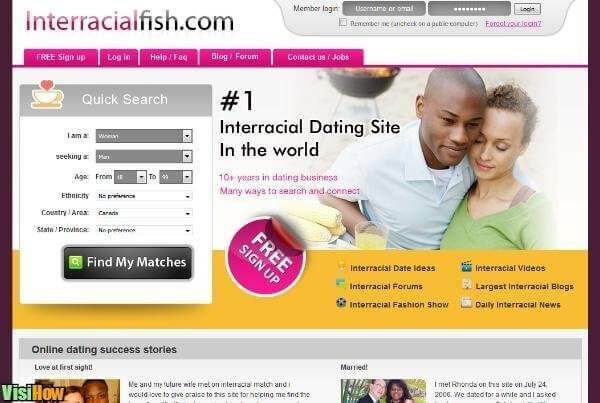 Both single men and women who are interested in an interracial relationship are free to join Interracial Fish. Interracial Fish was established to match people for dating and even for marriage. The website specializes in matching people who would like to get to know and date other members from other races. If you visit this online dating site, you will notice that you and its members have the same interest as you. Another good thing about Interracial Fish is that they make sure that you don’t only meet people from your country but from all over the world. In fact, they have thousands of members on the site to match up with you. Unlike other dating sites, Interracial Fish has three different processes when signing up. The first part would be your necessary information, including your age, name, and your email where the verification will be sent. The second would be the profile setting ups wherein you will find categories and questions that you may need to answer. This is also the part where you will share information on the type of relationship that you want or the parameters for that match. These parameters may include job, education, personal habits, and as well as physical appearance. The last part would be uploading your pictures and providing a short introduction about yourself. As mentioned above, signing up is free, and this is referred to as the site’s Standard membership. As a free member, you will have the freedom to set up your profile to improve your chances of meeting your match. Of course, since it’s free, the features are limited. For instance, since you are on a free membership, you won’t be able to initiate contact with other members. This can be frustrating at times, especially if you find the one that you truly is looking for. For the Gold membership, the cost will usually depend. We can tackle that a little later after we discuss the features. The features are the same as with the free members, but there are more. You can initiate the conversation, which is a good thing. You will also get to have access to premier customer service, so if you need anything, you can easily contact them. Another good thing about being under the gold membership is that you can share your ideas with other members by using the forum and the blog. Unlimited instant messaging and other messaging features are also available. You can either pay for your membership via PayPal, Credit Card and Check Card. Their one-month membership will renew automatically. So if you don’t feel like continuing, turning off the billing for Interracial Fish would be best. The blog and forum page is where Interracial Fish will let members interact with each other. They can ask questions or share their dating experiences with the others. Members can also use this page to express who they are. The blog and forum page will create a community for singles who are looking for their perfect match. There is also a reverse match feature on Interracial Fish, which can’t be seen in other dating sites today. This feature will help a member to find the right matches who fit their description. Reverse match if a useful feature because it will help you find members who are looking for the same qualities as you. This feature is available in other dating sites as well. Let’s Meet is similar to speed dating, wherein they skip the getting to know you stage. This feature will let you scroll quickly though matches and their photos. It will then highlight all of the members that best match your preferences, and both of you can set up an actual date. You probably know by now that one of the most important things when it comes to online dating is the customer service. The reason behind this is because you need someone to talk to if you are having problems with the site. You can reach them 24/7 using their toll-free number, which can be found on a website. Members who have upgraded their members will always be prioritized. Another important thing that an online dating site is privacy and safety. Having a verified account is essential, as this is a significant proof that you are the person that you said you are. Typically, you will be able to get verified by sending your ID via fax, internal messages, and email. Being verified members are seen as trustworthy. Also, Interracial Fish will not sell your information to any third party companies no matter what. As mentioned above, Interracial Fish is perfect for all ages, so if you are looking for an interracial relationship, then you should try out Interracial Fish. You can either go for the standard membership or the gold one, whichever suits your preferences. Just make sure to get yourself verified and to be cautious when talking to others. It would be best to talk with members who are also verified.